Midway through fall, the conditions conducive to algal blooms in our state has wound down. These blooms occur during warmer temperatures and benefit from longer daylight, more stagnant waters, and where nutrient concentrations are high. In North Carolina, there were nasty algal blooms in several areas in the State as noted in a Department of Environmental Quality press release. Sound Rivers documented a particularly nasty bloom in the Chowan. Algal levels in Jordan Lake, a regional drinking water supply for several Triangle communities also violated federal water quality standards in spite of Solar Bees, an experimental technology funded by the legislature to reduce the levels of algae in the water supply. Outside the State, scientist monitoring the Gulf of Mexico reported that polluted runoff helped to increase that waterbody’s dead zone to nearly 6500 square miles, its largest area since 2002 and roughly equivalent to the combined areas of Connecticut and Rhode Island. On the West Coast, “The Blob”, made its presence known as it wreaked havoc by closing coastal shellfish beds and disrupting marine life. 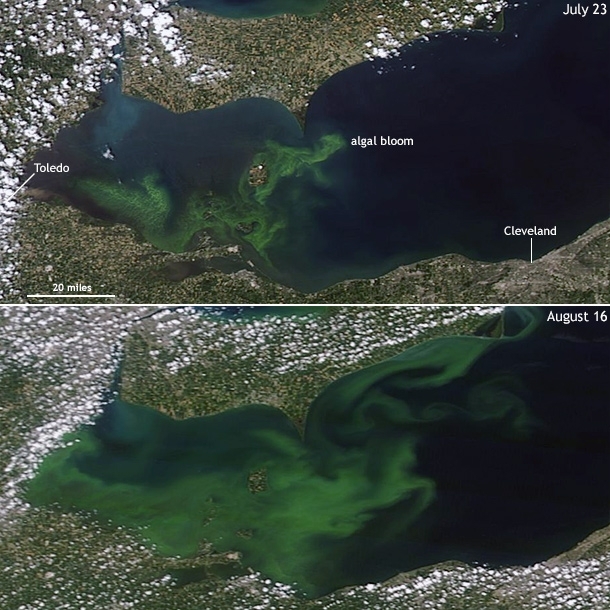 Finally, on Lake Eerie, NOAA reports that blooms were more severe this year than they were in 2014 when harmful algae in the Lake led Toledo Ohio to advise residents to stop drinking their tap water. The nation and our state are continuing to wrestle with the problems associated with excess nutrients in the environment. Recent NC legislative efforts to delay actions aimed at addressing the source of the problem, nutrient runoff, isn’t getting us closer to solving this problem and making cost-effective solutions harder to find.